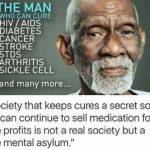 Alkaline, created as nature intended has been inspired by the late Dr Sebi. Who has touched the core of my being about 'What We put in our mouths' that damages our being in regards to food. This journey has had instant Impact for me; internally, physically and mentally and Spiritually.